The Face Shop Rice Water Bright Cleansing Lotion – Review, India. The Face Shop is a South Korea-based skincare and cosmetics manufacturer, retailer and a franchise business. 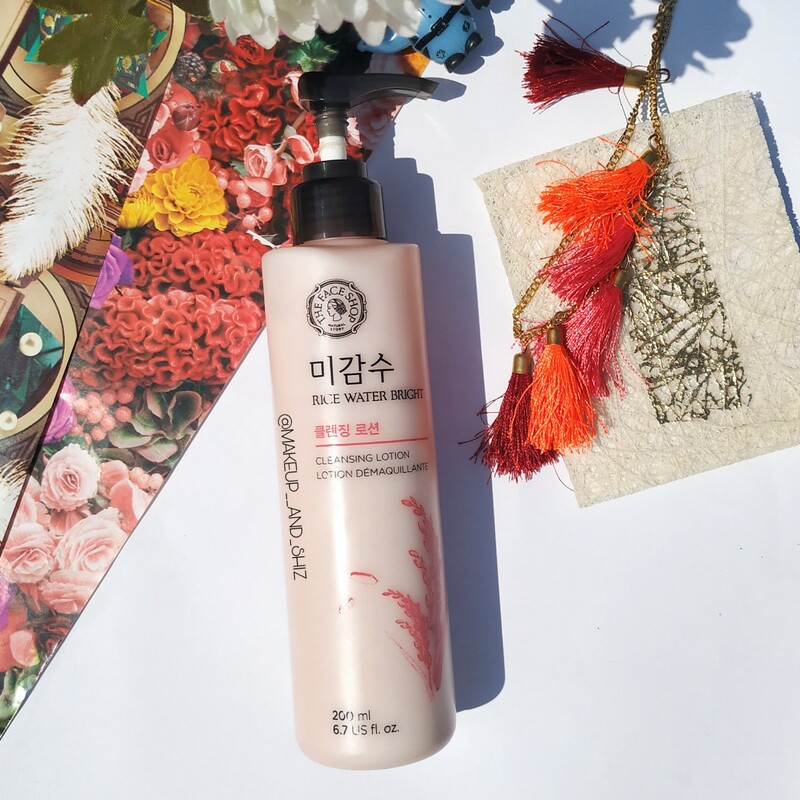 Korean skin care Products are emerging in Indian market and so is the concept of Double Cleanse. The double cleanse is the cleansing method Korean women use for clear skin. It involves washing your face in two steps, first by using an oil-based cleanser, followed by a water-based cleanser. The first step draws out oil-based impurities such as sebum, SPF, and pollutants while the second step cleanses water-based debris such as sweat and dirt . Today’s Review is The Faceshop Rice Water Bright Cleansing Lotion. It comes in a plastic bottle with a pump. The bottle is long , cylindrical and is not that travel friendly. The pump however works just fine. The texture of this is very creamy , extremely creamy and it melts in your hand or face. It smells like rice water somewhat. I have been using this for more than a month and I absolutely love it. Firstly for removing everyday makeup ( concealer, blush, mascara and lipsticks ) I just need one pump of the product. I take one pump of the product in my hand, warm it up, and then apply to my face like a cream. After that, some day I wipe it up with makeup wipes and wash with facewash. And sometimes , I skip the makeup wipes. This one is really good for my dry skin. And of course you need to go ahead and use a facewash. You can’t leave it by just using this. Yes. Of course. This has become my favourite. If you have normal to dry skin, you should get this. If you have oily/combination skin, you can get this too. Don’t be afraid by ‘ creamy, oil based ‘ words . And rice doesn’t break most people and anyway you are gonna use a facewash later. Doesn’t have a strong smell. That was all for this post? Have you used this product ? Let me know. Previous Nykaa Skin Secrets Sheet mask Black Mud+Aloe Vera — Review.